Tom still has it; the stamina, the fortitude, the razor-sharp aim. Even with altered vision and fingers scarred from thousands of blood inducing needle pricks, Tom still has it. He can still take down a common house fly with laser precision using nothing more than a rubber band. Tom IS the Lord of the Flies. It has been far too long since our last post here. Life and time just got in the way, but, I did want to let you all know how things are going with Tom since his eye surgery this past December. He is doing well. His right eye has healed. He is working hard, both designing at the computer and in the office, and physically, building things, repairing the riding mower, hauling tree limbs, chasing grandchildren, and forever digging holes for me to plant in. Tom soldiers on. While the surgery went well, Tom’s vision has not improved as we had hoped. The macular edema remains a challenge as it still “thinks” the epiretinal membrane, peeled away during the surgery, is still in place. In an effort to retrain the macula, shots continue to be injected into the eye by the retinal specialist. The good news is that the length of time between shots has lengthened, giving us hope. In-the-meantime, Sir Thomas is still the Lord of the Flies! I’m glad to know that Tom’s surgery went well and really hope there will be more improvement in his vision. As for his fly-swatting skills, they are amazing. I mostly miss them with a fly swatter, so would never hit them with a rubber band. Dear Penny and Tom, Lord of the Flies! I have three cats who would challenge you, Tom, for that title, but I wouldn’t because I can’t aim well even with a fly swatter. I’m so glad to read that there is a longer time between shots and I so hope that your vision will settle and then improve. I’ll picture the two of you there at the cut-off and I’ll see healing white light around you, Tom. Years ago–1964–I was teaching in a farm community and many of the senior boys had no interest in literature. They kept they eyes on the weather outside because their thoughts were with their fathers on the farm. 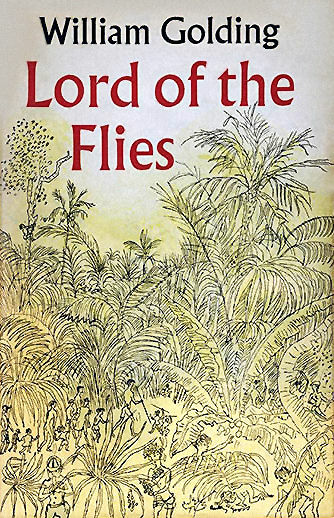 Then I introduced to them a new book–“The Lord of the Flies.” It captured their interest and their imagination. They simply loved the book. And after we’d finished it and done all our discussing of it–and those discussions just intrigued me because of what I was learning about these boys–they asked, “Sister Innocence, are there any other books like this one we could read?” I don’t remember what I said or if I found some books for them. I just remember blessing William Golding for his writing, his style, and for his choice of subject matter. Peace.